Hydrogeo have been working in collaboration with Balfour Beatty on behalf of Hertfordshire County Council on the Ascot Road Free School project. 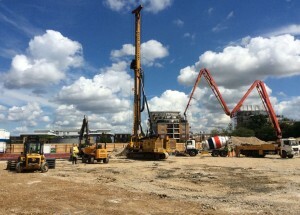 The school is being built upon a part of the former Royal Mail Depot, Watford in order to meet local demand for primary school places in Watford. Hydrogeo had assisted with the site to the south which was redeveloped as a Morrisons Superstore and opened in November 2013. The team were commissioned by Balfour Beatty to undertake a Geoenvironmental Review of available information across the proposed school site to the North of the Morrisons store. 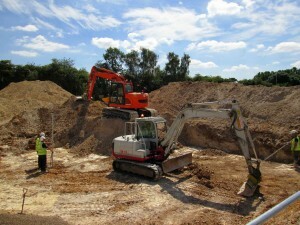 Following this review process a site investigation was progressed in order to augment existing site investigation data. Prior to the commencement of site enabling and construction works phases, Hydrogeo formulated a Remediation Strategy for the school site. This collated key site investigation data and detailed the works required to remediate the site to a standard considered suitable for the proposed school in accordance with Planning Conditions assigned to the development by Watford Borough Council. Hydrogeo have been retained by Balfour Beatty in order to verify the development process in accordance with the regulatory approved Remediation Strategy. Works are currently on-going with the School due for completion and opening it’s gates in 2015.